My first day as a teacher was a COMPLETE disaster. It was also the defining moment of my career. You can read all about it here if you want, but for now let's just say I discovered that lecturing would NOT be my method of choice. Luckily rather than quit the profession, I veered in a direction that has brought me great joy in the classroom. Creative teaching. Once I knew that lecturing was not and would never be for me, I began the search for the hundreds of other ways that exist to put information across and inspire students to think deeply and produce creative work. 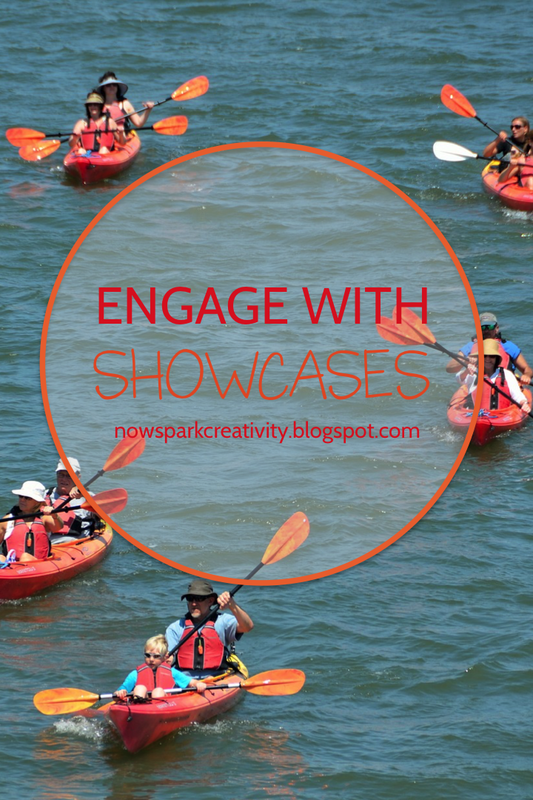 One of my favorite methods for bringing creative engagement to any unit now is something I call the showcase project. A showcase project is simply an exciting culmination for any unit, generally involving an authentic audience for student work beyond just my own eyes. It could be a project gallery, a debate, a mock trial, a play performance, a poetry slam, a speech, a creative story festival, the unveiling of a mural, a video awards nomination event, etc. The sky's the limit! The great thing about a showcase project is that it builds engagement THROUGHOUT the unit, not just at the end. If you can weave the project into the unit, then students know that everything they are reading, writing, and saying is related to this big event they are (hopefully) looking forward to. Let me tell you about a few showcase projects I have done with my students, and how the projects helped boost student engagement with the unit as a whole. When I read The Canterbury Tales with my sophomores, it wouldn't be putting too fine a point on it to say they HATED it. We spent every class minute just desperately trying to understand what was happening. They couldn't understand the language, so they couldn't dive deep. They didn't really get what was going on - a storytelling contest full of humor and intricate detail - because they were so turned off by the language that they couldn't engage. Many of them spoke English as their second language, and I would never have chosen Chaucer for them at that moment in their education, but it wasn't up to me. So I got to work trying to come up with a showcase project that would help draw them into what was really going on in the text. I came up with an idea to do our own storytelling pilgrimage. I asked them all to write their own original stories and get ready to perform them to their classmates as we took a hike around campus at the end of our unit. As in the text, we would award one fabulous story with a special prize. As the students worked on their own stories and looked forward to our special day, they began to invest more in Chaucer's stories. Suddenly everything seemed to make a little more sense. On the final day of the unit we wandered campus, pausing at every inviting rock and tree for someone to tell their story. We finished with a party and voted to give several stories special awards. I invited several of my administrators to attend (always a good idea to share your best work with the higher-ups!) and we all enjoyed the wonderful event. I honestly think my students will remember that Chaucer unit, that started so poorly, with a proud glow. Another showcase project that I love to use for plays is what I call the progressive performance. I first learned this technique from Martha Andresen, my amazing Shakespeare professor and adviser in college. In every term of her Shakespeare class, she would have her students perform one play, divided by acts, at different locations around campus. Each group would choose a theme, design their own sets and costumes, and rehearse in a location of their choice. At the end of the term, the class would travel around the campus, viewing the acts in order. I have done this showcase project with both Death of a Salesman and Long Day's Journey into Night. Since we don't spend a whole semester on it, I choose vital scenes from throughout the play to assign to my students. Then we sprinkle rehearsal days in throughout the unit and finish with the progressive performance. This means that right from the start, students are imagining the world of the play for their own performance, and thinking deeply about the character they will be performing and his or her relationships with the others in the play. As we read and discuss the work, each student brings that perspective to the conversation and engagement can't help but rise. With every class I've tried this project with, the final performances have been moving, meaningful, and memorable. So many students struggle with poetry, that I knew even before I started my first poetry unit that I would need a wonderful showcase to help them engage. And that's how I first learned about poetry slam. I've already done an extensive post on how to host a poetry slam or jam, but let me just say that using poetry slam is an ideal way to get students to pay attention to poetry. When every writing workshop just might produce the poem they will eventually perform for their peers, and every video clip and piece of text is filled with techniques and examples of how to weave ideas and images together in poetic language that they just might want to use in their own pieces, engagement is the obvious choice! When I was in high school, I didn't particularly love the novel Madame Bovary, but I did LOVE the mock trial we put on of Flaubert for offending the public decency in conjunction with our reading. I was Flaubert's defense lawyer, and I actually went so far as to visit the public university in my hometown and track down the original transcription of Flaubert's actual trial. I reveled in my preparation to destroy the prosecution. Perhaps that's why I always love doing mock trials in class. My Bulgarian tenth graders put Danforth and Hawthorne, from The Crucible, on trial to discover whether or not they were to blame for letting the judicial process get out of control in the text. We had quite a rip-roaring event in class for that one. Again, we met in our teams throughout the unit, building engagement with the text overall as well as preparing for the final assessment. I could give you many more examples. I let very view units slip through my fingers without a showcase project of some kind. My whole curriculum is built around them. What showcase projects do you do? What might you want to try? Swing on over to our Facebook group, Creative High School English, and tell us all about it! We LOVE to learn from each other.